I am honored to be among a talented group of ladies who participate in a collaborative photo project which concentrates on focusing on our everyday moments. This month's theme is light. After our big snow storm yesterday, I peeked out the window at sunset to see the most spectacular, vibrant sunset. It was absolutely stunning. I grabbed my camera and ran out to the front porch, knowing I had only minutes to capture it. Unfortunately, the view from my front porch includes my neighbor's home along with their 4 cars. I really didn't want to include that in my composition, so I got low and focused on the bushes to hide the distractions. I hope you will continue around the circle by visiting my talented friend Sarah. 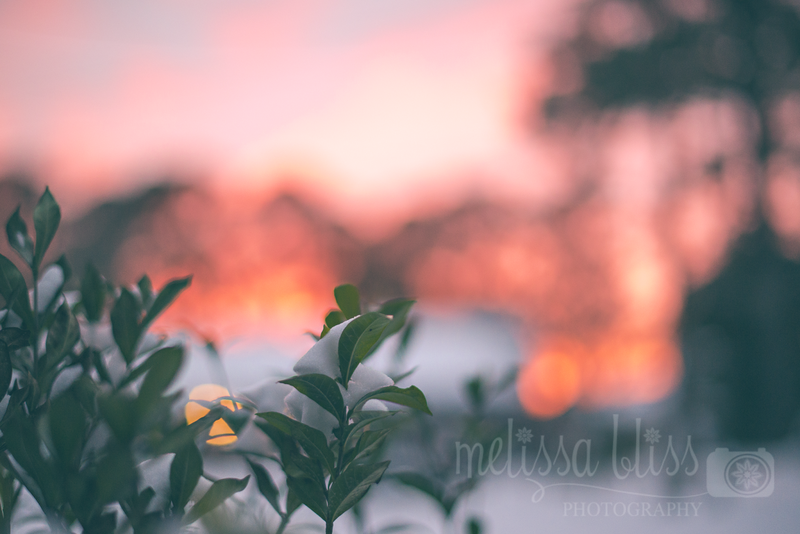 This is really beautiful, Melissa! You did an excellent job of hiding the distractions...I would have never known they were there. Beautiful sunset for certain! What an amazing shot you captured! I love the softness of the light. So beautiful! Beautiful image. Great light and color. You did an awesome job hiding any distractions! Great photo. What a great idea for a tough situation. Gorgeous color and bokeh! You'd never know there were any cars there if you hadn't said!